Eye bags to the left and right of the packaging; chocolate milk sachet rolled in paper below. I’ve been feeling under the weather and very sorry for myself so I dipped into my stack of goodies from new Irish online store, Opoko. The White Witch products particularly appealed: 100% Irish, 100% natural, 100% organic and 100% biodegradable; there’s a lot to like. But how do the products work, and did I fall under their spell? Happily, both products were easy to use. I popped a sachet of the Chocolate Milk Bath into the tub and, while waiting for it to diffuse and release its antioxidant-y goodness, I made a cup of tea. 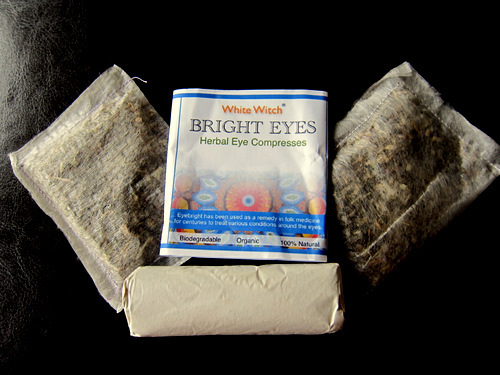 Except I used my Bright Eyes Eye Bags, which look very much like extra-large teabags, but filled solely with eyebright -- a herb used in traditional folk medicine to treat tired or irritated eyes and other eye conditions. I left the mug cooling beside the bath while I wallowed in my Chocolate Milk. Like the eye bags, you get two tea-bag like sachets, individually wrapped up in paper, and filled with pure milk powder, fair trade dark cocoa powder, fine organic oatmeal and bicarbonate of soda. The sachet had a Coco-Pops effect on the bathwater, and scented the room with the mouthwatering scent of real chocolate. No synthetic nasties here! It felt absurdly indulgent; even more so when I covered my eyes with the cooled down eye sachets. I emerged feeling relaxed, refreshed and thoroughly pampered. Opoko stock a wide range of White Witch products, from bath products to body lotions and balms, hair tonics and cleansers. I also spotted these steamers on the brand’s own website, which have piqued my interest – they remind me of the LUSH Steamer tabs that I’ve recently fallen for. Do you like using natural and organic products? Will you be trying anything from White Witch for yourself? Sounds like a lovely way to make yourself feel a little better - have a great weekend Emma and hope you feel better soon. Soooo trying this place when I am home for Christmas. Coco pops effect- love that image. Do these eye bright things make the whites of your eyes whiter? Because I'm all over that. I confess to not noticing whether they whitened the whites of my eyes but they did take down the redness and stop them looking so tired. Which is a winner in my book!